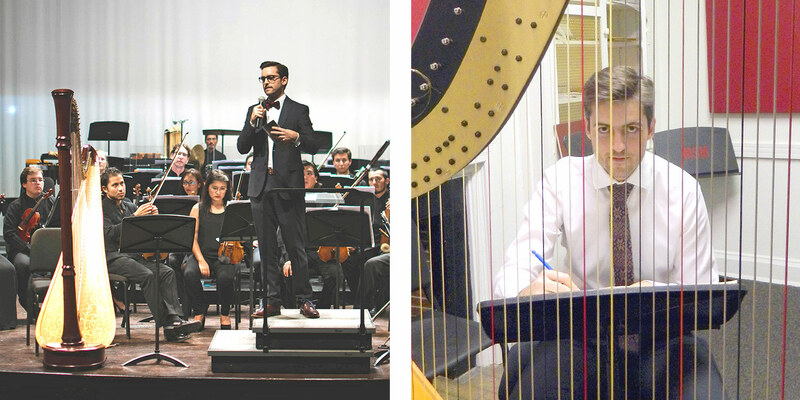 Tonight, Los Angeles Chamber Orchestra (LACO) will present the U.S. premiere of current doctoral student Juan Pablo Contreras’ harp concerto, Ángel Mestizo. The event, which begins at 8:00 pm at Hauser + Wirth in Downtown Los Angeles, is part of SESSION, a series in which LACO musicians collaborate with compelling composers in unique spaces. In 2017, maestro Marco Parisotto and the Jalisco Philharmonic Orchestra visited USC’s Bovard Auditorium for the premiere of Mariachitlán by Juan Pablo Contreras, pictured at center. Recognized as “one of the most prominent young composers of Latin America” (Milenio), Contreras’ music has been performed by major orchestras across the globe. “Every time I sit down to write a new work, I ask myself what should I write about in order to keep my profession as a composer relevant in the world we live in,” he says in a promotional video for his new work. Ángel Mestizo tells the story of the harp’s migration from Spain to Mexico during the Spanish conquest and traces its evolution in becoming one of the most iconic Mexican folk instruments. “This piece is a true exploration of my identity as a Mexican composer,” he explains. 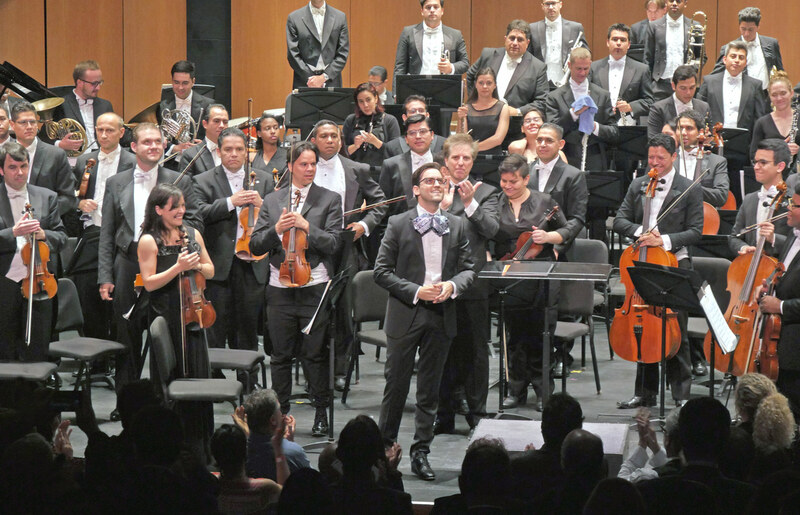 Left, Juan Pablo Contreras with the Boca del Rio Philharmonic Orchestra. Right, Contreras in his studio. Contreras won the 2014 Arturo Márquez Composition Contest with the concerto, and the orchestras of Jalisco, Mexico City, and Boca del Rio all performed the piece. 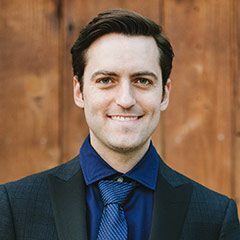 The work is featured on his first album, Silencio en Juárez, along with two other works, Silencio en Juarez, a piece for violin, clarinet, cello and piano, and La mas Remota Prehistoria, for tenor and chamber orchestra. Next up, LACO will perform the world premiere of his composition, Musas Mexicanas in February, 2019 at the Moss Theater.